Create appointment or task from email. Email2Task add-in for Microsoft Outlook. Email2Task is an easy to use add-in for Microsoft Outlook allowing you to convert email messages into Outlook tasks or appointments. Create task from email message or convert email to appointment in just 2 clicks. Quickly move emails to any folder you want. Create Outlook tasks or appointments from email in two clicks. Email2Task is an easy to use time-saving add-in for Microsoft Outlook opening new ways to take control of your email Inbox and organize your information in Outlook. It allows you to speed up routine tasks. 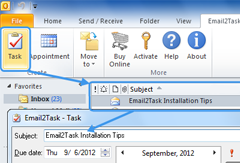 Create Outlook task from email message or convert email to appointment in Outlook in just 2 clicks. Turn email to calendar events, convert email to task and attach email. Move emails to predefined folder in one click. Modify the task or appointment details quickly in Email2Task simplified form. File Outlook email messages with Email2Task. Select any folder for a new task or appointment. Choose to delete the email after the task or appointment is created. Quickly organize your information in Microsoft Outlook with Email2Task time saving software addin. Works with different Microsoft Outlook versions (2010, 2007, 2003, 2002, 2000). Compatible with latest Windows 7 and Outlook 2010. Creating task or scheduling appointment from email made easy. Create a task item from email message easily. If you wish you can choose due date and prioriry of the task. Create an appointment item from an email message. If there is need you can easily change appointment subject, location, start time and end time. Move emails to folders quickly. You can move your emails to default folder in few clicks. Software add-in for Microsoft Outlook available for quick access from Outlook toolbar, Actions menu, right-click on item menu. Move emails to one of last 3 Outlook folders used picked from quick list or default folder in one click. Select any Microsoft Outlook folder to create task from email or convert email to appointment. Modify the task or appointment details quickly. Delete the email automatically after the task or appointment is created. Move the email to a predefined folder automatically. Attach the email to a created appointment or task. Safe PST Backup for Microsoft Outlook Personal Backup Outlook software. Backup Exchange folders and PST files using Safe PST Backup. Back up Email, Contacts, Calendars or other folders. Create Microsoft Outlook PST backup email archive automatically.